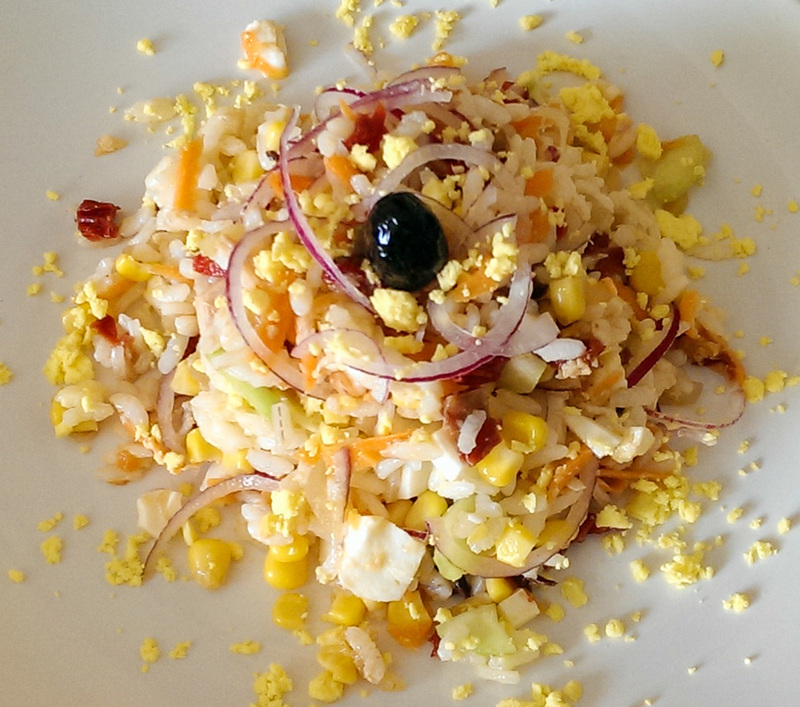 Insalata di riso is the ultimate Italian summer classic. Usually, it is prepared in large quantities as it keeps well in a fridge and can be handy as lunch-pack even the day after. It's a perfect take-away lunch for a picnic or a day at the beach as it is very fresh, light and tasty. Chop all ingredients coarsly: dice the cheeses, slice the onion in thin slices, cut the hot dog sausage in 4 lenghtwise, then into slices and crumble the tuna into pieces. Mix all ingredients in a bawl, add sweet corn and a dash of olive oil. Boil rice in salted water, drain it and let cool down. Once the rice is cold, mix it in with the rest adding salt, pepper, vinegar and mayo to taste.